By all accounts, it's been a pretty controversial week for Donovan McNabb. As a guest on ESPN's "First Take" Thursday, McNabb said that his former team, the Washington Redskins, were bound to ruin quarterback Robert Griffin III, the player they're expected to select with the #2 pick in April's draft. During the conversation, McNabb stopped just short of calling Redskins head coach Mike Shanahan a fool before saying the offense Shanahan runs will only hold RG3 back. The disgruntled signal caller was at it again the following day. This time, taking aim at the New York Jets newest acquisition, Tim Tebow. McNabb suggested that Tebow should tone down his recent spree of feel-good tweets and focus more on football. For the record, Tebow has issued a grand total of eight tweets since being traded from the Denver Broncos to the Jets. An output that probably took all of about two minutes. "There's no need to keep trying to have the fans fully behind you," McNabb said, taking exception to ESPN's Skip Bayless suggesting Tebow is "the most unfairly, over-criticized quarterback" in NFL history. "Negative - I am, I am," McNabb responded. "Nobody has been criticized as much as I have throughout my career." Granted, McNabb received more than his fair share of scrutiny from the fans in Philadelphia during his tenure there. But let's face it, he brought a lot of that on himself. That's what happens when you repeatedly fall short in key moments and fail to deliver the city a title over the course of 11 seasons. And as far as what went down in both Washington and Minnesota, in case you've forgotten Donovan, you were awful. Not even a shell of your former self. I'd say that gives people the green light to criticize you. It's pretty obvious that McNabb's career is now in the tank, so for him to decide to go out in this manner is just sad. Bitter at the Redskins. Still at odds with Philly. 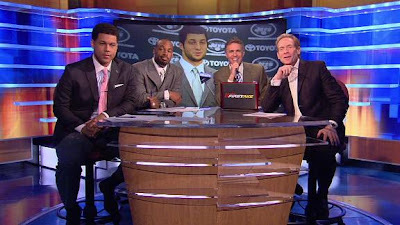 Hatin' on Tebow. Don't be that guy Donovan. Nobody likes that guy. You're better than that. You had your day, but now it's over. Move on. Always liked McNabb, but I agree. He just needs to take his ball and go home. He was a guest on the show giving his take on the topics being discussed. What was he suppose to do? I see nothing at all wrong with the man giving his opinion.